The great country singer and guitarist – actually a highly gifted multi-instrumentalist – Glen Campbell is the most delightful thing to come out of Delight, Arkansas these past 78 years. Glen has been a glorious fixture on the music scene since 1960 when he moved to Los Angeles to become a session musician. His career then rose on a steady arc as he parlayed his talents into working with Phil Spector’s Wrecking Drew, playing on recordings by everyone from Frank Sinatra and Dean Martin to Spector, Bobby Darin, Ricky Nelson, The Monkees and many others. In short he was an indispensable character on the LA scene and was so gifted that when Brian Wilson took a sabbatical from the Beach Boys in 1964 he became a touring member of the group and played bass, adding his vocal skills to the mix to the extent that many didn’t even realise Wilson was AWOL! He also played lead guitar on the Pet Sounds sessions. As a solo artist Campbell’s Capitol albums made him a national and international superstar. He is the most legendary interpreter of Jimmy Webb’s songs for one thing and has sold in excess of 45 million discs, won numerous Grammy Awards (making history in 1967 by claiming a straight four in the Country and Pop categories) and owns the ultimate accolade of the Grammy Lifetime Achievement Award, which he received in 2012. Similarly, the Country Music Association has recognized him for his groundbreaking covers of John Hartford’s “Gentle On My Mind” and Webb’s signature pieces, “By the Time I Get to Phoenix”, “Wichita Lineman” and “Galveston” where his ability to breathe adult heartbreak into blue collar scenarios ensure Glen is a treasured individual. A feisty and funny man with trenchant opinions and a tongue in cheek philosophy, Glen has also appeared in movies, notably being hand-picked by John Wayne to co-star in the comic Western True Grit. Of course he also had a hugely successful networked TV show of his own, The Glen Campbell Goodtime Hour on CBS US that featured a variety of the leading stars of the late 1960s and 1970s. Campbell is one that rare breed of artist who is synonymous with his own hits – he is the “Rhinestone Cowboy” and it’s his face that one conjures in the mind’s eye whenever he tackles a Jimmy Webb place name song. Sadly, Glen was diagnosed with Alzheimer’s disease in late 2010. He is in good hands and we wish him well while we salute his marvelous history. The seventh son of twelve children Glen Travis Campbell was born in 1936 and became a largely self-taught guitarist who was soon fronting his own band The Western Wranglers in the late 50’s. His next move to the surf and garage outfit The Champs helped make his name on the West Coast and he became gun for hire and then a key member of the so-called Wrecking Crew, an elite California-based ensemble of players who sat largely in the background and made the name singers of the day sound good while eschewing the glory themselves. A partnership with Al DeLory at Capitol pushed Glen into the limelight. A sequence of quality recordings showcased his guitar and voice and a penchant for inhabiting the protest songs of the era. 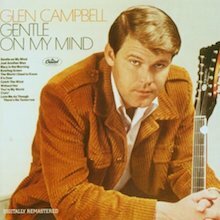 Campbell’s first crossover success is Gentle on My Mind (1966) where he tackles the John Hartford track and makes it a standard while also pouring balm on Harry Nilsson’s “Without Her”. Steady radio exposure sent that album to number one on the Billboard Country chart. Now working with DeLory and Nick Venet, Glen embarked on a sequence of massive sellers – all of them highly recommended for your discovery today. By the Time I Get to Phoenix (1967) and A New Place in the Sun (1968) teamed Glen with top players like Hal Blaine and Joe Osborn while the Bobbie Gentry and Glen Campbell disc (1968) offered a fine fusion of male and female duet skills. All are recommendfed for dfiscovery. Wichita Lineman (1968) held the Christmas number one slot in the USA, even keeping The Beatles double album at bay. With drummer Jim Gordon and bassist Carol Kaye on board Glen really nails Webb’s title song and also offers the definitive versions of “Dreams of the Everyday Housewife” and Tim Hardin’s “Reason to Believe”. Galveston (1969) maintains an incredible run of top placed albums with Webb connotations and Glen Campbell Live (1969) captures him in heroic form at a New Jersey concert. That prolific winning streak doesn’t abate as the new decade dawns. The conceptual soundtrack and cult item Norwood and The Glen Campbell Goodtime Album (the latter featuring a superb reading of “MacArthur Park”) are the prelude to an update of his approach with the more progressive The Last Time I Saw Her (1971) where contemporary singer songwriters like Gordon Lighftoot and Kris Kristofferson enter his radar. Thereafter it’s a case of discovering albums that never stand still, encompassing Christian country and folk, and always keeping an ear out for the best new talent in town - as well as the tried and trusted as in the case of I Remember Hank Williams (1973) a disc that pre-empts the latter-day movement whereby old hands are brought back into focus. Reunion: The Songs of Jimmy Webb (1974) is a classic that slipped through the net but cries out for rediscovery now with a cast including Buddy Emmons on steel guitar and a Jimmy Bowen production. Having taken a sabbatical from the mainstream Campbell roars back into contention with the massive selling Rhinestone Cowboy (1975) whose epic title cut soars to the number one slot, as does the album. This is a five star affair. That standard is maintained on Bloodline and matched by Southern Nights where Glen brings the newly minted Allen Toussaint title song to public attention – a man of impeccable taste. The Live at The Royal Festival Hall double is well worth tracking down as it contains a peachy Beach Boys medley, an entire side of Webb (with Jimmy conducting The Royal Philharmonic Orchestra) and an all-star band on hand to create one of the most classic yet overlooked live artifacts of the era. Campbell is also the first artist to deal with Webb’s song “Highwayman” written after the songwriter dreamt he was an English outlaw being chased to his doom, a reverie he had in a London hotel! That song would become the name of the famous country group fronted by Willie Nelson, Johnny Cash, Kris Kristofferson and Waylon Jennings. 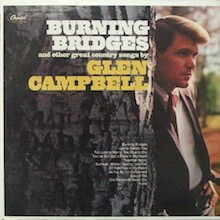 Campbell’s version fronts up the self-named album and brought Glen fresh impetus. Not to be forgotten either are the discs Old Home Town and Letter to Home, more elegiac and grown up affairs. Re-energised we find Glen excelling on Still Within the Sound of My Own Voice (1987), utterly in the moment and back with Bowen. A switch to MCA results in a slew of high quality albums: check out Walkin’ in the Sun since features another excellent Toussaint cover in “You Will Not Lose”. Back with Liberty, Campbell embarks on a series of contemporary country albums. He will record with the South Dakota Symphony, proffering a virtual greatest hits resume and then up his game on Meet Glen Campbell, tackling songs from the pens of Tom Petty, Travis’s Fran Healy, Dave Grohl, U2 and Paul Westerberg on an acclaimed gem that features guest musicians like Rick Nielsen and Robin Zander (Cheap Trick), Jason Falkner, Wendy Melvoin (Wendy & Lisa) and Roger Joseph Manning, Jr. This brings him to an entirely new crowd and also raises his press profile as a younger generation suddenly sits up and takes notice. With his illness now confirmed Glen bravely records the excellent Ghost on the Canvas disc and embarks on his Good Times: Farewell Tour, still bringing the house down every night and wowing fans old and young with some breathtaking performances. The Glen Campbell and Jimmy Webb In Session…(2012) is actually a rediscovered song-cycle performed live at Fantasy Records Studios that is thoroughly recommended as both men rose to the occasion and reminded us of their staggering mutual history. The most recent disc is the knowingly poignant See You There, a deeply nostalgic resume that bookends a fabulous career. There are numerous compilations available. Try the Platinum selling Greatest Hits or the ubiquitous Twenty Golden Greats – both offer the familiar hits. But while there are dozens of splendid anthologies to choose from, and every home or car needs at least one of those, it’s the parent albums that need evaluation. An all-round entertainer of the highest caliber, Glen Campbell is a real star of our times. We cherish him here and hope you enjoy discovering his work again. Jimmy Webb recently described Glen as “the greatest musician I’ve ever heard” – an unsolicited testimonial that bears investigation. 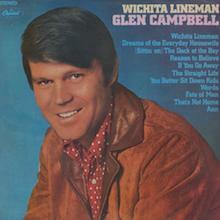 Glen Campbell's commercial breakthrough came by way of the title track, which was the direct precursor in production terms to "Wichita Lineman," and by the same writer. The cover of Paul Simon's "Homeward Bound" is sincere if a little perfunctory, but Campbell's rendition of Ernest Tubb's "Tomorrow Never Comes" is a bravura performance, rich and soulful, as well as recalling Rodgers & Hammerstein's "You'll Never Walk Alone" as done by Gerry & the Pacemakers. "Cold December in Your Heart" harks back to Campbell's country-folk material, a piece of midtempo country-pop. Material like that and the similar "Back in the Race," Dorsey Burnette's "Hey Little One," Jerry Reed's "You're Young and You'll Forget," and Bill Anderson's "Bad Seed" hold up better than more pop-focused numbers like "My Baby's Gone," though the string backings on most of these very much date them. The final number here, the touching "Love Is a Lonesome River," makes a brilliant coda. By the Time I Get to Phoenix was reissued in August of 2001 in a newly remastered, upgraded edition, with somewhat crisper sound, as part of Capitol-Nashville's Cornerstones series. The best of Campbell's early albums, and also his first real commercial success. Ironically, the title track (written by John Hartford) which started Campbell on the road to stardom, was never intended for release -- he had submitted it as a demo, and Capitol issued it, to everybody's profit. Campbell's cover of "Catch the Wind" is one of the finest covers of a Donovan song ever done, stripping away any hint of the composer's sub-Dylan pretensions and bringing out the song's genuine beauty -- it's folk-pop, in the same manner that Peter, Paul and Mary's cover of Dylan's "Blowin' in the Wind" was, but excellent folk-pop. This is Campbell's folksiest album, albeit with string orchestra accompaniment, as he covers "Bowling Green," "Mary in the Morning," and the title tune, and you get to hear him do a solo guitar and voice number, his own "Just Another Man." Even the most overproduced stuff here, "You're My World" and Rod McKuen's "The World I Used to Know," come off well, and Campbell is in excellent voice throughout, most especially on a wonderfully restrained and beautiful rendition of Roy Orbison's "Crying." Gentle On My Mind was reissued in August of 2001 as part of Capitol-Nashville's "Cornerstones" series, in an upgraded, remastered edition with crisper sound than the 1996 Capitol CD. 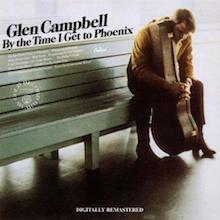 On Glen Campbell's albums -- By the Time I Get to Phoenix and Wichita Lineman -- the Jimmy Webb-authored title cuts tended to dominate the LP tracks somewhat; good as the album tracks were, they usually weren't quite up to the standard achieved by the AM-aimed title songs. 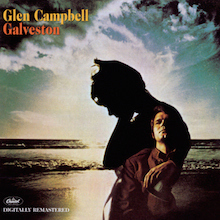 On Galveston, Campbell and producer Al DeLory overcame that problem -- the Jimmy Webb title tune is fine, to be sure, but this time out, Campbell and DeLory no longer felt the need for the singer to cover contemporary rock and soul hits like "Homeward Bound" and "Dock of the Bay," which he pulled off, but not as well as some other songs he might've sung on those earlier albums. On Galveston, he stuck closer to country with some pop embellishments and found a better fit. The result is a smooth, lively, sentimental, and occasionally even exciting album. Jimmy Webb's "Where's the Playground Susie" was the other hit off this album, but no one needed to think of skipping to it, around such heartfelt Campbell performances as "Gotta Have Tenderness" or "Time"; "Friends," built around the melody to "Danny Boy," may come dangerously close to sinking in mawkishness, but Campbell compensates for it with another co-authored effort, "If This Is Love," a stunning guitar workout with a haunting melody and sincere urgency in his singing; he also shows off his guitar prowess (and the harder side of his voice) on "Oh What a Woman," and to some extent on "Every Time I Itch I Wind up Scratching You." And he wraps himself very neatly around the New Christy Minstrels' number, "Today," singing it with a directness and honesty that makes one forget the original. Galveston was finally reissued on CD in August of 2001 as part of Capitol-Nashville's Cornerstones series, remastered in state-of-the-art sound that is a wonder -- on "Oh What a Woman," the hardest number here, you get the close thump of the bass, nice and upfront, and crisp guitars, and the rest of the album isn't far behind. It's only 28 minutes long, but it shows off the romantic, the virtuoso, and the country sides of Campbell's persona about as well as any album he ever cut. This disc, a certified double-platinum album, captures Campbell's appeal at his most mainstream, mixing mid-tempo country-pop, spiced by a smooth if unambitious cover of Otis Redding's "(Sittin' On) The Dock of the Bay" and the prettiest version of Tim Hardin's "Reason to Believe" ever done. The latter two make the album hipper than Campbell himself seemed at the time to most of us. On the other hand, there's ample romantic pop here, including his heartfelt, string-laden performance of the McKuen/Brel "If You Go Away" and "Words." Right there at the center of Campbell's appeal is the still-beautiful title track (for which he had composer Jimmy Webb's organ hauled to the studio to re-create its exact sound from the demo) and "Dreams of the Everyday Housewife," alongside mid-tempo country-pop like Billy Ed Wheeler's sprightly "Ann" and Campbell's own "Fate of Man." Sonny Curtis' "The Straight Life" is closer in spirit to the Mary Tyler Moore theme song (still a year or so away) than to the work of an ex-Buddy Holly compadre, and Sonny Bono's singsongy divorce ode, "You Better Sit Down Kids," did little to enhance the future congressman's musical credibility. He saves the best for last, "That's Not Home," the most heartfelt song here. The production is excellent throughout, if a little overly reliant on strings. Wichita Lineman was reissued in an upgraded, remastered CD edition in August of 2001 as part of Capitol-Nashville's Cornerstones series, with somewhat crisper sound than the 1996 vintage Capitol CD. Sometimes it seems like not a year passes without a new Glen Campbell hits collection, and the simply titled Greatest Hits -- a title that has been used in some iteration at least ten times since 1971, probably more -- is the 2009 installment in this plan. 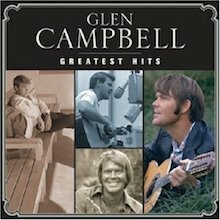 The impetus for this Greatest Hits is the growth in digital releases (the collection issued both on CD and digitally), as well as the desire to capitalize on his fine 2008 comeback, Meet Glen Campbell, represented here by readings of the Foo Fighters' "Times Like These" and Jackson Browne's "These Days," which nicely cap a collection of basics, 14 songs that appear on pretty much any other Campbell collection released in the past four decades or so. As an introduction, it's clean and lean, offering all of the big hits ("Rhinestone Cowboy," "Wichita Lineman," "By the Time I Get to Phoenix," etc. ), which will appeal to new listeners perhaps hooked by Meet Glen Campbell -- and conversely, old fans may be enticed by the two new cuts. However, this is nothing more than basics: there are compilations that are more comprehensive and interesting out there for those who are interested -- but for those who just want the hits, this has them. In contrast to his major albums of the second half of the '60s, which were mostly produced exclusively by Al DeLory and were drawn from defined sessions, Burning Bridges is a more uneven, transitional creation, assembling several years' worth of sides in Campbell's output from 1962 through late 1966, and produced by DeLory, Steve Douglas, and Nick Venet. The result is a decidedly variable body of music, much of it from the sentimental side of the country repertoire, including the Bacharach/David "Too Late to Worry, Too Blue to Cry." The best parts are the Campbell original "Less of Me" and "Burning Bridges" (which dates from a time when his label thought Campbell might be another Jim Reeves or Eddy Arnold), and "I'll Hold You in My Heart" and "You've Still Got a Place in My Heart" have endured on various compilations. But there's nothing here as accomplished musically or as bold in sound and construction (within a pop context) as the best album tracks -- forget the singles -- that Campbell would cut with DeLory over the ensuing three years. It doesn't really matter if Glen Campbell was Jimmy Webb's best interpreter or if Webb gave Campbell his best songs -- in other words, it doesn't matter who helped the other more -- because it doesn't change the essential fact that the duo fit each other so naturally. Webb's intricate, idiosyncratic compositions sounded warm and accessible in Campbell's hands, while the songs revealed Campbell's musical range and ambition. Other singers had big hits with Webb's songs and Campbell made tremendous music with other people's songs, but there was something special about their collaboration that was evident on their big hits of the '60s: "By the Time I Get to Phoenix," "Wichita Lineman," "Galveston," "Where's the Playground, Suzie?." 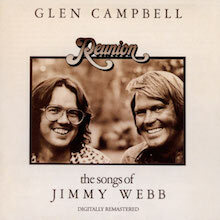 These songs provided the background for Reunion, the 1974 album where Campbell and Webb reunited for a set of Webb songs. Well, that's not exactly accurate, since Webb never produced or arranged the hits Campbell had in the '60s, and the record isn't entirely written by Webb, since it features Susan Webb's "About the Ocean" and Lowell George's "Roll Um Easy" (here retitled "Roll Me Easy"). So, this marks the first time that Webb arranged a full album of Campbell's, along with providing the majority of the songs, a move that in many ways made this closer to a Jimmy Webb record than a Glen Campbell LP. Certainly, it favored Webb's idiosyncrasies, particularly his elliptical songs with winding melodies and no straightforward songs. Not a song here outside of "Roll Me Easy" announces itself as a potential single (which very well may be why this tremendous song was added to the play list, particularly as the first single, since it might be the easiest way into the record for most listeners). Since most of the songs share a similar easy mid-tempo pace and have similar lushly interwoven arrangements, it's not necessarily the most accessible of Campbell's records; it doesn't set out to alienate, it's just that Webb's songs and arrangements call for close listening, which is precisely why it's an album beloved by Campbell/Webb connoisseurs. So, it's not entirely surprising that the record didn't make much of an impression, certainly nothing close to their big hits of the '60s, but rather that it's become a cult item, with some fans regarding it among Campbell's best work. And, in many ways, they're right. Reunion has a quiet power that grows with repeated listenings since it does indeed showcase Webb at his best as songwriter/arranger and Campbell as an interpretive singer. But this is very much a record for the dedicated, those that are already convinced of the strengths of both men, because it reveals its gifts slowly, and even when they're out in the open, the songs are so delicately, if exquisitely, crafted they're best appreciated by listeners with an eye for detail. Those listeners will surely find Reunion among Campbell's best work, and it is certainly among his most consistent and ambitious records, but it's just a little too reserved to play to an audience outside of the already converted. 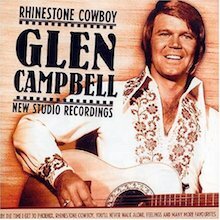 Early on in Rhinestone Cowboy, Glen Campbell sings that he's making his "comeback," a sentiment that can't help but seem to carry an autobiographical heft. While it is true that he was hardly off the charts in the early '70s, the quality of his music was a little inconsistent; the singles were often good, but his albums were burdened with schlock and erratic in quality. He started to break free with a pair of 1974 albums, Houston (I'm Comin' to See You) and the Jimmy Webb duet Reunion, but it wasn't until 1975's Rhinestone Cowboy that he seemed in full control of his talent, delivering a record that stands proudly next to his '60s peaks. Much credit is due to the presence of producers Dennis Lambert and Brian Potter, who help focus Campbell through their own tunes, their expert selection of songs, and their shimmering, high-gloss production that dazzles on the surface but also delivers considerable thematic and musical substance. Throughout the record, there are allusions to Campbell being a country boy stranded in the big city, where he's successful but emotionally adrift. This is most evident on the album's two big hits, "Country Boy (You Got Your Feet in LA)" and "Rhinestone Cowboy" itself, but his yearning is underpinned by sad songs like "I'd Build a Bridge," the despairing "We're Over," and a heartbreaking version of Randy Newman's "Marie." Among this, a cheerful cover of the Temptations' "My Girl" seems a little out of place, but this is the only outright misstep in an otherwise masterful album that manages to sound soothing even when it's sad. Even with its undercurrents of melancholy, Rhinestone Cowboy sounds and feels like a triumph because of the assured, layered lushness of the Lambert/Potter production and Campbell's fine performances. He sounds engaged by the material, bringing out nuances within the songs, and it's positively a joy to hear after several years of wandering. 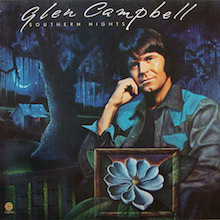 Following two excellent records made with producers Dennis Lambert and Brian Potter, Glen Campbell turned to Gary Klein for 1977's Southern Nights, a record that retains some of the feel of Rhinestone Cowboy and Bloodline but is simultaneously too streamlined and diffuse, never developing the unified sound of either of its predecessors. That hardly means it's a bad album, of course; but it does mean that it's a record of moments, individual bright spots that stand alone and never quite gel into something cohesive. Part of the problem is that the best moments have different, not necessarily complimentary, moods. There are the two big singles, Allen Toussaint's "Southern Nights" and Neil Diamond's "Sunflower," both sharing a cheerful catchiness and a bright, colorful feel. Then, there is a pair of songs from Jimmy Webb, "This Is Sarah's Song" and "Early Morning Song." While not on the level of the fine Reunion, they both offer further proof that Campbell is Webb's best interpreter. Along with a good, albeit slightly maudlin, reading of Brian Wilson's "God Only Knows," the other highlights are two songs from Michael Smotherman, a singer/songwriter who would be given a greater showcase on Campbell's next effort, Basic. Although now a forgotten songwriter, Smotherman was a solid tunesmith, firmly within the '70s sensitive singer/songwriter tradition, and his songs bring out the best in Campbell. The rest of the record -- "Guide Me," "Let Go," "How High Did We Go" -- are also from forgotten writers, and they're entirely too generic soft rock, emphasizing that Smotherman had some true skills (something that Basic confirmed). So Southern Nights is a bit of a mixed bag, but those three separate sets of highlights are excellent and help elevate the record to one of Campbell's better ones, no matter how flawed it ultimately is. 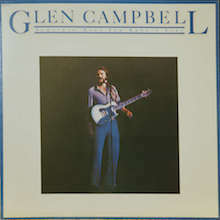 Released in 1980, this was Glen’s 36th album and it includes two minor hits from the Country music chart, including the album’s title track, a duet with Rita Coolidge. ‘Somethin’ 'Bout you Baby i Like' also made No.42 on the Billboard Hot 100. Produced by Gary Klein the album features Jeff Baxter on guitar, who had made a name for himself playing with Steely Dan, as well as Dean Parks and Glen himself. Tanya Tucker sings backing vocals with Glen and while this is a lesser known of his albums it is something of a hidden gem that includes songs by David Gates and Neil Diamond with Carole Bayer Sager.